I want to share my experience with the Math Mammoth curriculum because we have tried a few programs over the years inducing Horizons and Math U See. This is the only one that was a fit for my ADHD, SPD son who was initially in public school special education using Everyday Math. 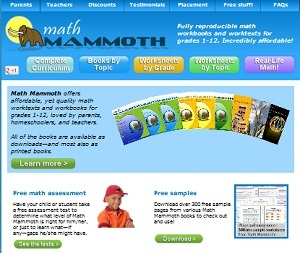 Math Mammoth is a mastery based method that is downloaded from the internet in Word, PDF and HTML formats. They also offer the curriculum on a disc and in books, however the books are in black and white (I think), while the electronic forms are in color. You print out what you need. It includes chapter reviews, tests, answer keys along with supplemental materials and links to websites that offer lessons, practice and games for each concept being taught, though not all are free and some links are broken. I believe most of the grade levels are now standards based. We are just finishing up 4th grade and are adding and subtracting mixed numbers. Next, we learn to compare fractions by multiplying and dividing. The last chapter is adding, subtracting and multiplying decimals. The lessons make use of mental math tricks with step-by-step explanations of the concepts. There are plenty of color graphics to enhance the lessons, but not so much as to be distracting. I was able to integrate my manipulatives (which unfortunately are too distracting for my son). Explanations and practice problems are on the same pages, so there are no separate teacher’s materials except for the answer keys, which do not need to be printed.